At the personal request of the Marquise de Pompadour herself, the famous sculptor creates a small sculpture of the god of love Amur. 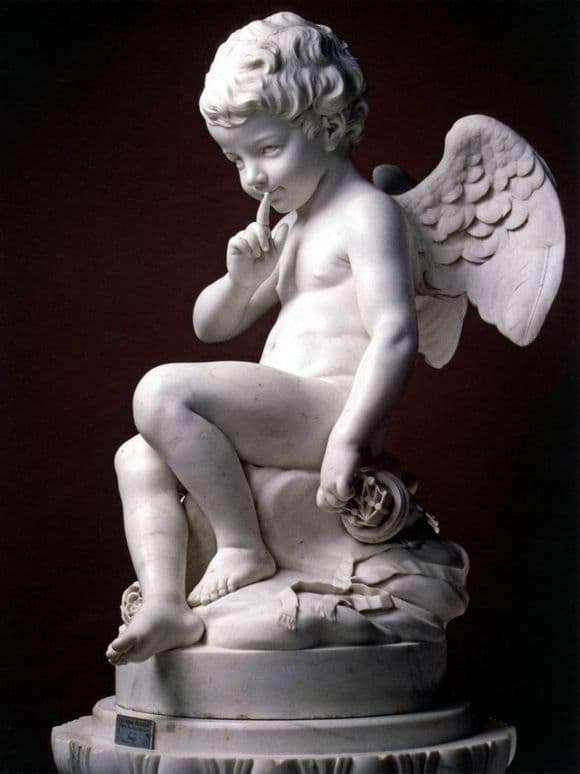 The marble figurine depicts a winged cute boy and received the name “The Dangerous Cupid”. Since the first exhibition, sculpture has become popular. First, the repeated statuettes were made by the author himself, and then numerous copies of her unknown masters appeared, which only increased her popularity. Since then, the “Dangerous Cupid” has become an integral part of the interior in the Rococo style, a kind of its emblem. Falcone depicted this all-powerful god in the form of a child. So he not only embodied the idea of ​​the eternal youth of the deity, but also gives the image of mystery and a little wickedness. His cupid presses his finger to his lips, as if urging to be silent about something. The mystery created in this way attracts those who look at the statue. They are trying to guess what can be silent god, who has power over the hearts of others. Or maybe this gesture is intended only to divert attention from the true intentions of the boy. After all, his second hand sneaks to the quiver of arrows. Most likely, he noticed another goal and is ready to hit the heart with an arrow in order to kindle the fire of love. But both gestures explain each other: love should be silent, so as not to arouse the envy of those who did not know it, and no one knows when this feeling will overtake the person and who will become the chosen one of the heart struck with an arrow. In order to know the true meaning of the sculpture, you will need to go round, see every detail and, comparing all its aspects together, put together the whole image of the sovereign of hearts. Human perception will also depend on the sequence of reading features of the sculpture. Thus, Falcone plays with his audience, drawing her into the world of art and beauty, where there is no single answer. The sculpture is full of hints and inconsistencies that can be interpreted differently. Perhaps the sculptor hinted at Madame de Pompadour and her connection with the king, or simply warned that the words in love were superfluous. But all the hints remain as light and elegant as the sculpture itself.